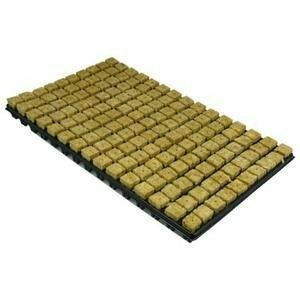 Grodan Rockwool Cubes are perfectly suited for propagation of cuttings and seedlings. - As rockwool is pH-neutral it should be soaked down to a pH- value of 5.5 - 5.8 before usage. - Size 2 x 2 x 4cm fits into bigger Grodan blocks with the small hole. Grodan Rockwool is spun from molten rock into fine fibers and then compressed into shapes like cubes, blocks, or slabs. Grodan has a unique position on the market because of manufacturing various types of fibers compared to other producers who cut everything from one big batch of wool. The purpose is to support the needs of the plants in different planting stages. Grodan has a tremendous capacity for absorbing nutrient solution while retaining plenty of oxygen for a faster plant growth. Grodan comes in standardized sizes. Cuttings started in cubes are easily transplanted into blocks and then onto the slabs or can also be transplanted into other growing mediums like soil or coco.